^ アラチュア・セミノールは、少なくとも第3次セミノール戦争まで個々のアイデンティティを保有していた。カウキーパーは1784年に彼の甥、キング・ペイン(en:King Payne)によって引き継がれた。ペインは1812年にジョージア民兵によるセミノールへの攻撃で殺された。彼の兄弟のボレク(en:Bolek)は、スワニー川までの一団の大部分を統率し、そこで彼らは1818年にアンドリュー・ジャクソンの戦役で擾乱された。次に、アラチュア・セミノールはフロリダ中央部へ移動し、1821年のボレクの死後、彼の甥ミカノピー(en:Micanopy)に引き継がれた。ミカノピーが捕らえられ西部に送られた後、彼の甥のビリー・ボウレグス(en:Billy Bowlegs、ホラタ・ミッコは、1858年に降伏するまで残ったセミノールを率いた。Weisman. Pp. 22-24. Covington. Pp. 143. ^ Missall. Pp. 4-7, 128. ^ Missall. Pp. 13, 15-18. ^ U.S. Army National Infantry Museum. ^ Officers of 1-5 FA. ^ Missall. Pp. 33, 40-41. ^ Missall. Pp. 33-34, 41-42. ^ Missall. Pp. 44, 47-50. ^ Missall. Pp. 126-134, 140-141. ^ Missall. Pp. 138-139, 142-143. ^ Missall. Pp. 144-147, 151. ^ Missall. Pp. 152, 157-164. ^ Missall. Pp. 169-181, 182-4. ^ Mahon. Pp. 282, 285-7. ^ Mahon. Pp. 313-4, 316-8. Buker, George E. 1975. Swamp Sailors: Riverine Warfare in the Everglades 1835-1842. Gainesville, Florida:The University Presses of Florida. Florida Board of State Institutions. 1903. Soldiers of Florida in the Seminole Indian, Civil and Spanish-American wars. at  - URL retrieved October 22, 2006. Kimball, Chris. 2003. The Withlacoochee. at  - URL retrieved October 22, 2006. Lacey, Michael O., Maj. 2002. Military Commissions: A Historical Survey. The Army Lawyer, March, 2002. Department of the Army Pam. 27-50-350. P. 42. at  - URL retrieved October 22, 2006. Office of the Chief of Military History, United States Army. 2001. Chapter 7: The Thirty Years' Peace. American Military History. P. 153. at  - URL retrieved October 22, 2006. Viele, John. 1996. The Florida Keys:A History of the Pioneers. Sarasota, Florida: Pineapple Press, Inc. ISBN 1-56164-101-4. Vone Research, Inc. The Seminole War Period. Coastal History. at  - URL retrieved October 22, 2006. "American Military Strategy In The Second Seminole War", by Major John C. White, Jr. "The greatest lesson of the Second Seminole War shows how a government can lose public support for a war that has simply lasted for too long. As the Army became more deeply involved in the conflict, as the government sent more troops into the theater, and as the public saw more money appropriated for the war, people began to lose their interest. Jesup’s capture of Osceola, and the treachery he used to get him, turned public sentiment against the Army. The use of blood hounds only created more hostility in the halls of Congress. It did not matter to the American people that some of Jesup’s deceptive practices helped him achieve success militarily. The public viewed his actions so negatively that he had undermined the political goals of the government." 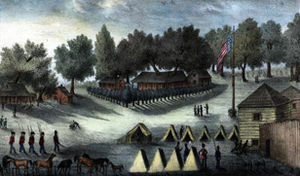 "Tour of the Florida Territory during the Seminole (Florida) Wars, 1792-1859" by Chris Kimball "The Florida war consisted in the killing of Indians, because they refused to leave their native home -- to hunt them amid the forests and swamps, from which they frequently issued to attack the intruders. To go or not to go, that was the question. Many a brave man lost his life and now sleeps beneath the sod of Florida. And yet neither these nor the heroes who exposed themselves there to so many dangers and suffer[ings, could acquire any military glory in such a war. (From "The Army and Navy of America," by Jacob K. Neff, Philadelphia, J.H. Pearsol and Co., 1845.)"